Elliott Neff reports that "260 players grades K-6 competed in the Dec. 17 scholastic tournament at Sunny Hills Elementary in Sammamish. The new format ... with sections for players rated under 800 was well-received." See the tournament results. Congratulations to Portland Winter Open winners Nick Raptis (Open Section, 3.5/4.0) and Brian Kaiser (Reserve Section, 3.5/4.0). The event was shortened to four rounds. Bainbridge Slugfest 2005 (Dec 10-11), Bainbridge Island, WA. BC wins! Junior chess players of Team BC won the December 10 team match by a score of 30.5 to 17.5. Results have been posted at: http://www.bjdy.com/juniorchess/news.html. WA wins! Washington vs. British Columbia match (invitational), Bellingham, WA. This time, the Washington team won by the convincing score of 8.5 to 1.5. See the match page! The USCF held its’ 2005 K12/Collegiate Chess Championship in Houston, Texas the weekend of December 2-4. 1575 players, representing 40 states, participated. The main event offered individual and team championships for each grade level, with seven G/90 games (that's a lot of chess!). Washington players performed well, including Michael Lee, who won the 6th grade section with a perfect 7-0 score. Michael was also named to the 2006 All-American Team! Ten of the fourteen participants from the Northwest each won an individual trophy in the main event. Photo: Michael Lee receiving his 6th grade 1st place trophy from GM Susan Polgar! WA Class Championships (Nov 25-27). Look for a report in NW Chess. See November Tacoma Chess Times (PDF file) for recent Tacoma Chess Club tournament results and other news. Results from NW Grand Prix events in Spokane: Kevin Korsmo & Zach Countryman split $50 in Turkey Quads, and Ted Baker also won $50. John Julian won $70 in Spokane G/10 1st Overall; Adam Attwood won $35 2nd Overall; Zach Countryman won $35 B/U 1600. With no publicity or warning, the 4TH AND FINAL APROPOS INVITATIONAL TOURNAMENT was held October 29-30 in Redmond, WA. This was the final qualifying event for the Apropos Cup, the championship tournament made up of the top 5 finishers from the four invitational events. Thanks to Kent McNall for sponsoring these events. Eastern Washington Open, held in Spokane September 17-18. Congratulation to winner Viktors Pupols, with 4.5 out of 5 points! Still playing strong after about 50 years! The 2005 Oregon Open was held Labor Day weekend. The tournament featured guaranteed prizes, both USCF and NW Chess Grand Prix points, and FIDE ratings!! Auntie's Open in Spokane – Congratulations to winners Paul Bartron and John Julian. Each scored 4 out of 5, earning a prize of $100 each. August Adjeeb Quads in Spokane – The winners were Phil Weyland (Quad A), Vern Johnson (Quad B) and Benjamin C. Blue (Quad C). Columbia Cup – Congratulations to Master John Readey, who won this event with a score of 4.5 out of 5. John's draw came against Class A player Mark Havrilla in the final round. Mark scored 4 out of 5, tied for 2nd place with Curt Collyer. Seattle Seafair Open at the Seattle Chess Club, Jul 29-31 or 30-31. Portland Summer Open – Congratulations to open section winner, GM Emil Anka, with 4.5 out of 5 points, drawing only with Clark Harmon, who tied for 2nd place with Rich Gutman. Keegan Knutson and Dan Mathews tied for 1st in the Reserve Section (U1800). Spokane Summer Lightning – Bad weather in the morning kept people away as lightning literally was all around in the afternoon. John Julian took first with 5.5/6. Adam Attwood had the best under 1800 with 4.5. John won $20 and Adam $13. Newport (Oregon) June Open – The winner was Nick Raptis with 4.5 out of 5 points. Larry Ball and Bryant Brownell tied for second in a 26-player field with 4 out of 5 points. Lilac Open June 18-19 – The Spokane Chess Club's annual Lilac Open was held at Gonzaga University, in cooperation with the Washington Chess Federation for the first time this year, the weekend of June 18-19. Congratulations to winner Nick Raptis with 4.5 out of 5 points. Geoff Gale, Chris Kalina and Phil Weyland finished with 4 points each. 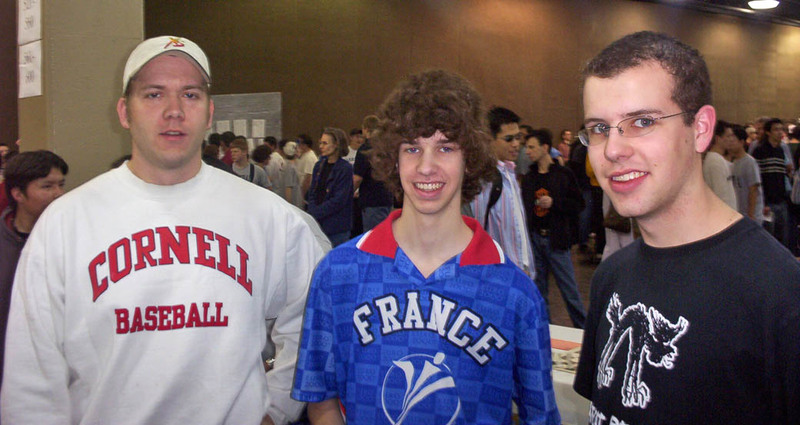 The 2005 Washington Open, held May 28-30 at the Lynnwood Convention Center, featured $12,500 in prizes, drawing the largest contingent of top-level players in many years! There is a very brief report in the June issue of Northwest Chess, with more results to be published in July. Pre-event story | Story 1 (with results) | Stories 2 & 3 (from Chess in the Media). Also see related stories on the ChessCafe scholastic chess page. Also see travel blog on Clatskanie Chess Club web site. Congratulations to Portland CC May 2005 Sunday Quads winners Drew Serres and Yamac Gungor. Yamac was unrated going into the event! Oregon Class Championships, May 7-8 – See story on USCF website. Congratulations to Mike MacGregor, the 2005 Tacoma City Champion with a score of 4.5 out of 5 in the tournament completed May 6 at the Tacoma Chess Club. Everett Chess Club first-ever club championship resumed play April 26. See club page. Oregon Chess Championship concluded April 24 at the Portland Chess Club. See a list of the players. See a list of Oregon chess champions, 1961 to date. See a status update on the Portland Chess Club website. Washington Elementary Chess Championships (Apr 23) – See the complete results on the WHSCA web site (including ratings report). Also see http://www.chessenrichment.org. Oregon Junior Open Championship (Apr 22-23). See the results. Congratulations to Inland Empire Open winners Curt Collyer and John Julian, tied with 4.5 out of 5.0 possible points. WA Junior Open/Reserve was held in conjunction with the Stevenson Chess Fest on Saturday, March 26. Congratulations to Washington Junior Open winner David Wyde. Gabriella Rader, 5th grader at Stevenson Elementary, won the junior girls playoff against two high school girls on April 2 to become Washington’s representative to the Susan Polgar National Tournament in Phoenix, AZ, August 6-11. Congratulations to Portland Chess Club March G/60 winners Nick Raptis and Vlajko Lakic (tied with perfect scores of 4.0 in a field of 26 players). Spokane Chess Club March Madness results: John Julian & Mark Havrilla tied for 1st overall with 3.5. They made $25 a piece. Adam Attwood took the best/U 1800 with 2.5 and made $20. Jim Waugh took the best/U 1400 prize and $20 with a score of 2.0. "Student Chess Champs Named" – story in The Oregonian about the annual Chess for Success Team Tournament held March 11-12 in Portland. Nick Raptis won the Portland Spring Open with a perfect score of 5.0. Geoff Gale finished second with 4.0, while William Gagnon won the Reserve Section with 4.0. Story in Yakima Herald-Republic about 38th annual Washington State High School Chess Association Team Championship, held February 26-27. Lakeside High School from Seattle won first place among the top 12 varsity trophy teams, edging out Garfield HS. Search the YH-R website for additional stories. Also see the story from The Seattle Times. "Students put minds, moves to the test" – The Oregon High School Chess Team Championship draws 181 contenders to Portland's Lincoln High – story from The Oregonian. Donaldson wins 2005 Collyer Memorial! – International Master W. John Donaldson repeated as the champion of the Dave Collyer Memorial in Spokane, winning the 13th annual event with a 4.5 score. He topped the 57 player field by half a point to claim the $300 first prize. See the full story on the Spokane Chess Club website. SLAVA 3-PEATS! The 2005 Washington Chess Championship and Premier events were held at the Oki Foundation Meeting Center, 10838 Main St, Bellevue, WA, on the weekends of February 12-13 and 19-21. Congratulations to Slava Mikhailuk for repeating as Washington State chess champion for the third consecutive year! See the full results. See USCF story. List of Washington State Chess Champions 1862 to Date. Lincoln County (Oregon) Student Chess Tournament (Feb 5) medal winners: Elementary: Antonio Sam, Ian Williams, Shianne Reischman. Middle school: Cameron LeClair (5-0 score), Josh Smith, Jeremiah Page. High school: Woody Crobar, Will Allen. TD: Robert Anderson assisted by Don Stein and Al Urben. Tacoma Chess Club Stephen Christopher Memorial Open (Jan 29-30) – Paul Bartron was the winner with a near-perfect score of 4.5, defeating runner-up Mike MacGregor (3.5 points) in the final round. Economy player Steve Buck also scored 3.5, and three players finished with 3.0 out of 5 possible points. "A winning gambit" story in The Tacoma News Tribune about the inaugural Russell Investment Group Scholastic Chess Tournament, recently held in Tacoma. Report from Vivi Bartron on Portland New Years Open (instead the Gresham Open) – Clark Harmon 1st with 4.5. Paul Bartron, Mike Morris and Blake Phillips (about age 16) 2nd with 4. Geoff Gale, who made the trip with the Bartrons, received 3.5. Results from the Spokane "Action Freeze" event (Jan 8) – The bad weather kept many away, so we had a round-robin of the five who showed. John Julian earned 1st with perfect score of 4.0 and took home $27. Adam Attwood earned Best/U1600 and $18 with 2.5.